Four National Park-themed bottles feature an insulating, double-walled design. 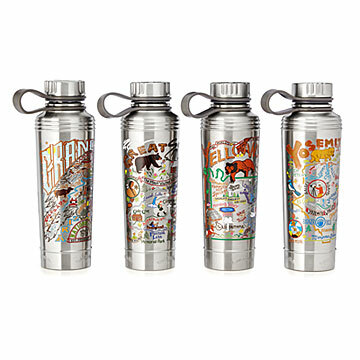 Whether you're waiting for Old Faithful's next performance or just waiting for your next meeting to start, keep you favorite hot or cold beverage at hand with these insulated bottles inspired by four beloved National Parks. Each one is decorated with iconic aspects of its park—wildlife, geographic facts, and natural wonders like El Capitan and the Appalachian Trail. Their double-layer stainless steel construction keeps drinks cold for an amazing 24 hours or hot for 12. Wide enough to admit ice cubes, the design also features a swing-top cap that stays put while you sip. The no-slip silicone bottom helps prevent spills and protects tabletops. 18-ounce capacity. Hand wash only. Designed in California. Made in China.